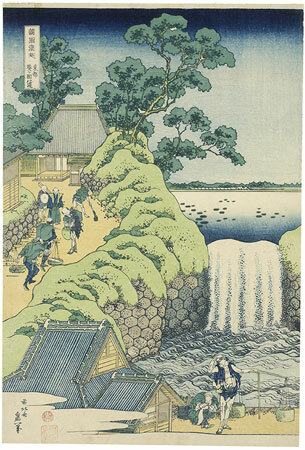 From “Tour of Waterfalls in Various Provinces”. A little waterfall is gushing out of a pond into a walled basin. A building rises up from behind the clouds on the lower left and a busy street leads further up to Aoigaoka, which is now in the district of Minato-ku in modern Tōkyō. The two small buildings, one near the water basin at the bottom and the other at the top of the hill, seem to be guard posts, since samurai and noblemen who valued peace and quiet lived in this area. Aoigaoka, or Hollyhock Hill, is in the Minato-ku district of modern Tōkyō. According to Edo Meisho Zue, a gazetteer of Edo published in the 1810s, “Beside the dam on the other side of the corner checkpoint, which is on the north side of the reservoir, is an area which has been planted with aoi, hollyhocks. This area is called Hollyhock Hill, and the slope that runs downwards to the east from here is called Aoizaka, Hollyhock Slope”. The tiled hut in the foreground and the other tiled hut on the hill to the left seem to be the corner checkpoints, or tsujibansho, mentioned in the gazetteer. These checkpoints were set up in this area where samurai and noblemen resided to maintain surveillance and keep order. The road sloping to the left is probably Aoizaka; the reservoir and the dam are on the right. Reproduced in: Ingelheim catalogue, no. 113.